With a little help from the NFL, UW startup VICIS is bringing together the latest in engineering and medicine to create a football helmet for the modern age. One of the realities of attending neurosurgeon Dr. Samuel Browd’s job as the medical director of the Seattle Children’s Sports Concussion Program is telling 14-year-olds that their futures in football are over. That’s the truth behind sports-related traumatic brain injury, after all, which touches millions of kids and adults each year and is the driving force behind VICIS, the research-propelled University of Washington startup that’s bringing together faculty and students to create a concussion-curbing helmet that aims to revolutionize the game of football. With the help of CoMotion, University of Washington faculty Samuel Browd, Jonathan Posner and Per Reinhall co-founded VICIS along with Dave Marver to commercialize the revolutionary helmet technology and turn UW research and innovation into impact. But none of that would have been possible without the ongoing support of UW faculty and students, whose research in engineering and medicine predates VICIS. The UW has become the epicenter for concussion prevention advocacy, and the first law to protect youth sports concussion safety came out of Washington state in 2009 after 13-year-old Zackery Lystedt was put back on the field just 15 minutes after suffering a concussion. It was a devastating decision that ultimately landed Zack on life support and a years-long recovery process to relearn basic skills. Unfortunately, Zack’s story isn’t all that unique. The Center for Disease Control and Prevention says a whopping 1.6 million to 3.8 million sports-related concussions occur annually in the U.S., and those numbers are conservative — as many as 50 percent of concussions go unreported. 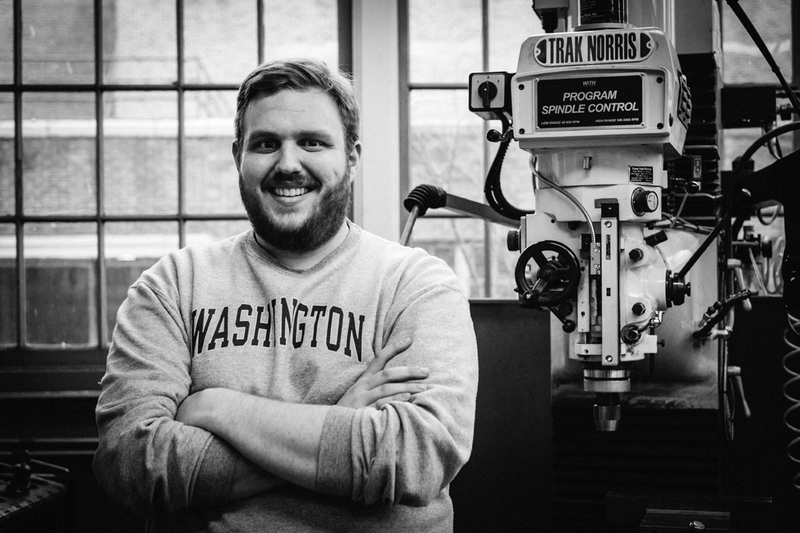 For the UW helmet research team, stories like Zack’s aren’t just a serious public health issue facing today’s society; they’re the reason VICIS — which means “change” in Latin — was formed: to turn UW research and innovation into impact. That solution is a much-needed update on the current helmet using the brains of faculty and students right here on campus, and if the support from the NFL, Under Armour and GE in the form of a $500,000 grant as a winner of the second annual Head Health Challenge is any indication, the team is on the right track. The UW has the opportunity to earn an additional $1 million in research funding from the Head Health Challenge this year, but the bulk of the support continues to come from its own backyard. VICIS’ offices are housed at CoMotion’s New Ventures Facility. Its prototypes and soft goods are built and tested in collaboration with UW mechanical engineering faculty and students. The group has a strong working relationship with the Seahawks — Dr. Samuel Browd covers concussion management on the sidelines as an unaffiliated neurologic consultant, and the rest of the VICIS team has access to the people who work with helmets on a daily basis: the equipment managers. As far as football’s concerned, Ryan Smith is more of an observer than a player. “I found out I was one of those people who didn’t quite like getting hit,” the senior in mechanical engineering says with a laugh. Fitting, considering his role is to conduct the National Operating Committee on Standards for Athletic Equipment (NOCSAE) drop test, which involves dropping a helmet-wearing humanoid head model onto an anvil from varying heights to rate the severity of the impact. To be eligible for NFL game play, each manufacturer’s helmet must pass the standards for the NOCSAE drop test. Ryan, who took a fluid mechanics class with professor Jonathan Posner during his junior year, was one of three undergraduates Jonathan deemed “the cream of the crop” and asked to join the team.